On our last visit to Paris in June, we did most of our travelling by bus, which meant time spent waiting at bus stops and journeys on which we gazed out the window at the streets, instead of hurtling through a darkened tunnel on the Metro. 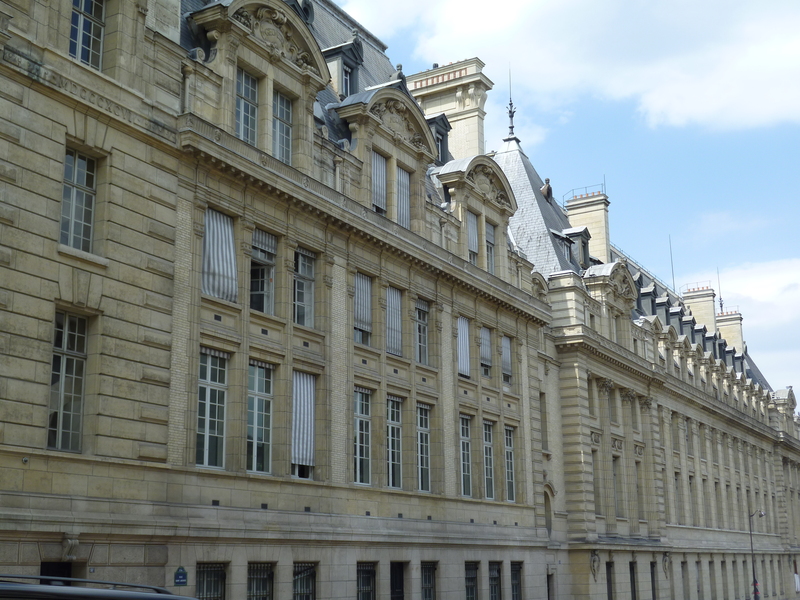 And that meant studying Paris facades, ever familiar and ever new, noting details and differences. This time it was shutters. I started to notice all the different forms and styles and began to photograph them. For example, here is a photograph showing the two most common styles of all – exterior wooden louvred shutters above and folding metal shutters below. Utterly ordinary, and yet remarkable. For no particular reason (other than what else are you going to do while waiting at a bus stop? 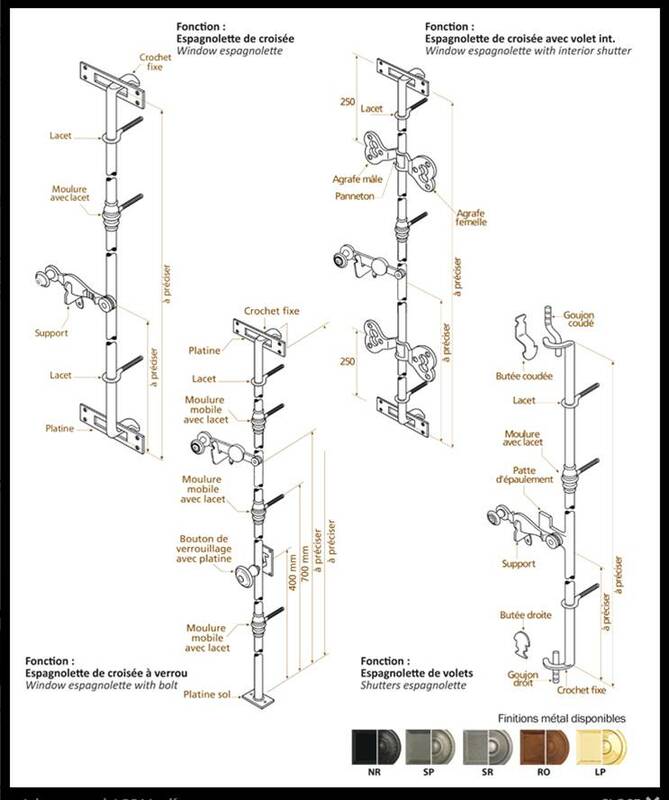 ), I decided to create a typology of shutters. 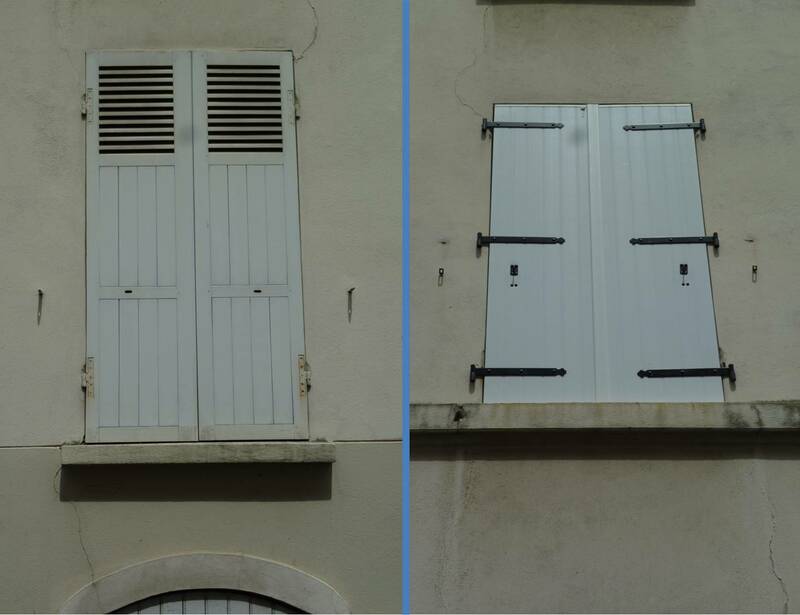 First off, those wooden shutters are called volets (or to be more precise, volets battants, to distinguish them from volets roulants, or roll-down shutters). 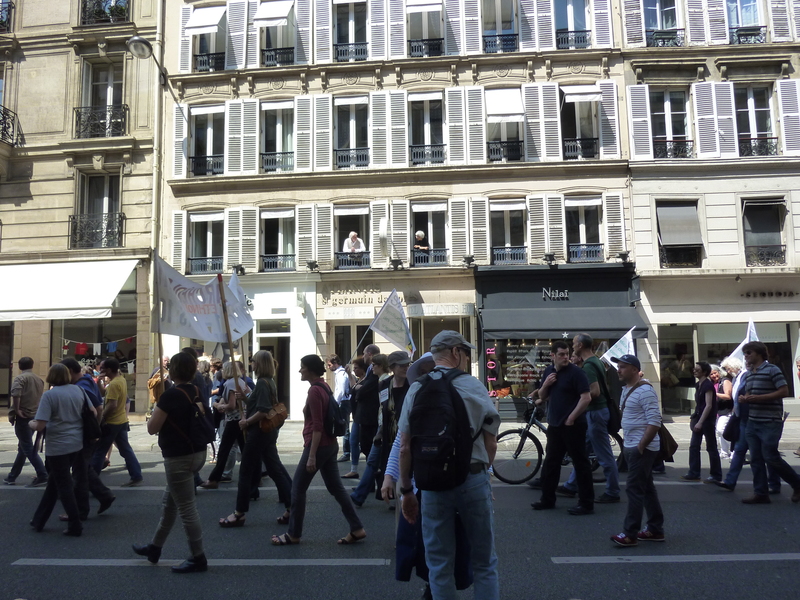 * Here is a typical Paris façade, photographed as a demonstration passed in front, with residents looking out to see what is going on. But when I looked again, I noticed that these windows are slightly unusual, because they are combined with individual awnings. These shutters need regular painting to keep them looking this tidy. Many Paris facades, however, do not get that kind of attention. Most, but not all, shutters have louvres in them to let through light or air. The term jalousie (literally, “jealousy”) was coined for shutters that allow the person inside to look out without being seen. The ones on the right with large and obvious hinges seem to be a very traditional design for what appear to be fairly modern security shutters. Inside the shutters, there are other details, all with specific terms. 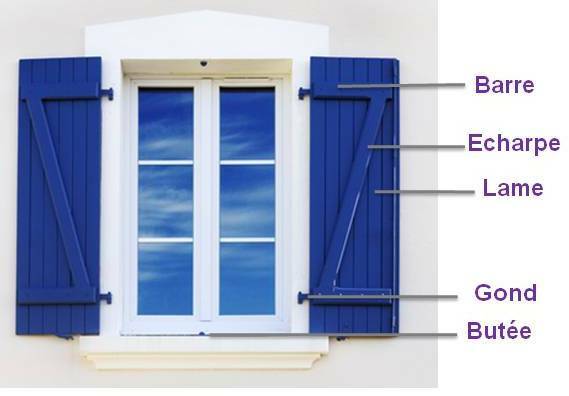 This comes from a helpful website called “lexique des volets,” by a shutter manufacturer. 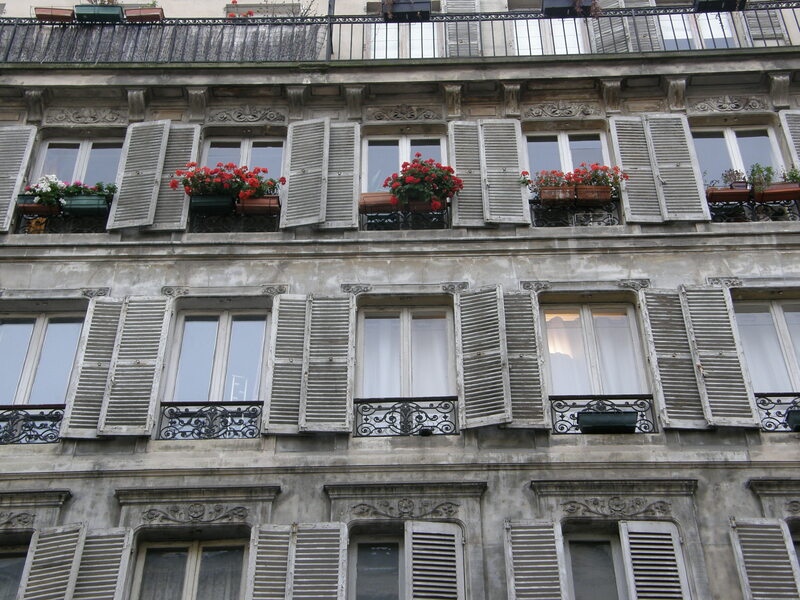 Such old-fashioned and rather rustic shutters can be found in Paris, if you look. Notice the hardware on the open shutters. The interior closing mechanism is called an espagnolette. There are several types, shown on the website of a woodworking company. Just when you thought shutters were simple things. But I wanted to find the word to describe something we have seen from time to time – the little fixtures on the exterior wall used to hold the shutter and prevent it from swinging back and forth in the wind. Some are plain, but some have faces or other decorations on them. 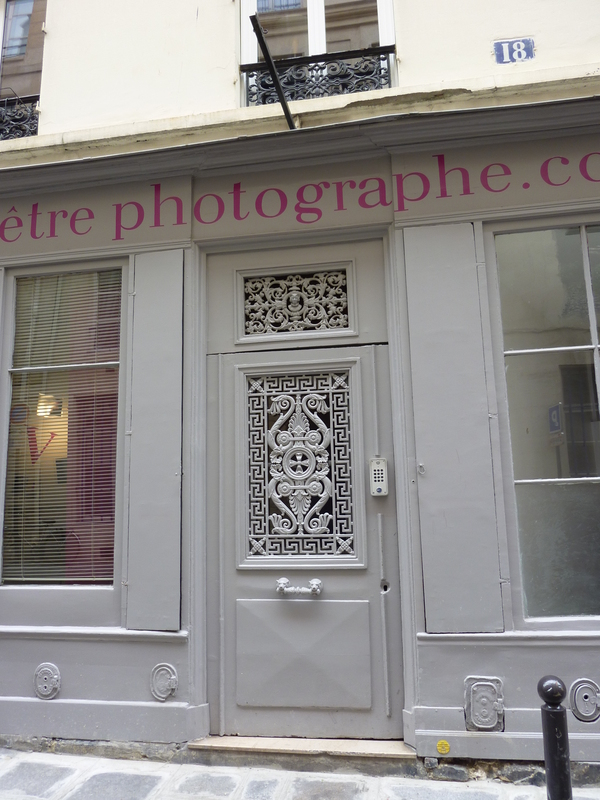 Norman photographed one in the Marais a few years ago. I found that they are called “arrêts de volet” (shutter stops) or “arrêts de vent” (wind stops), and they come in many forms and colours. You can still buy ones with faces on them: arrêts bergère, suggesting that the face with the hat and the long hair is that of a shepherdess. 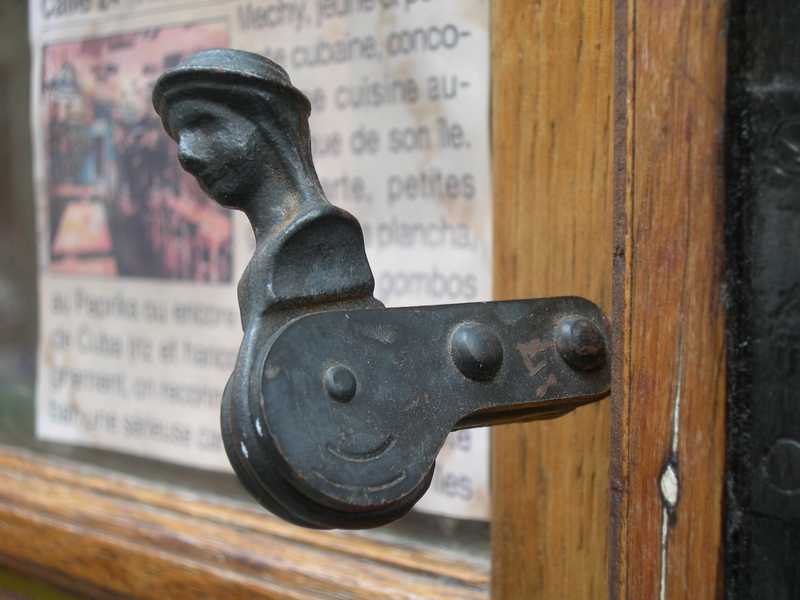 Isn’t French hardware wonderful? But these are modern ones. The oldest are simply bits of metal in a T-shape that project out from the wall and swivel to hold the shutter against the wall. 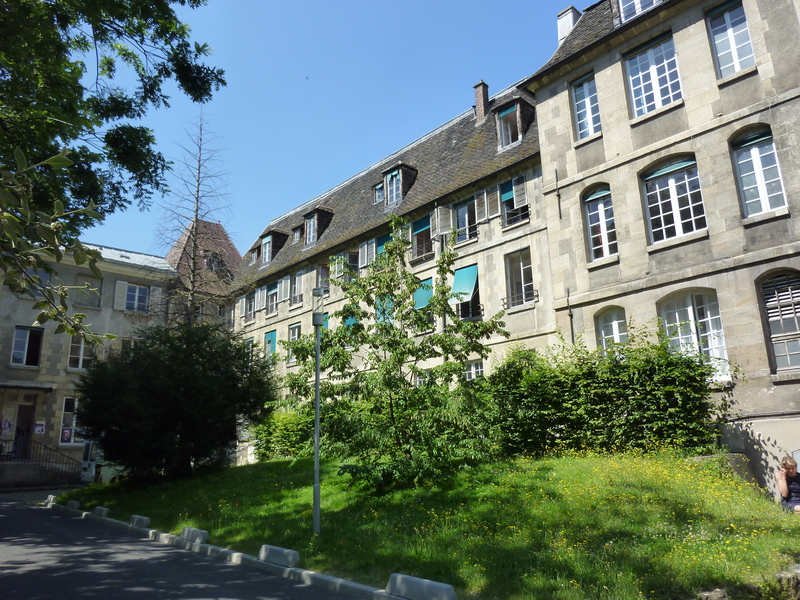 You can see them at the Maison de Balzac, where they are still in use, painted green to match the shutters. Then there are persiennes. The term is used for a variety of louvred shutters, but it seems to be the common term for those folding metal exterior shutters that we have wrestled with in various rented apartments. They always seem to be slightly bent, so it is hard to get the closing to engage. Years ago, when I was a student and au pair in Paris, I used to help an elderly lady downstairs with her persiennes in the evenings. She was in her eighties and very bent and frail. She seemed able to open them on her own, but struggled with closing them. 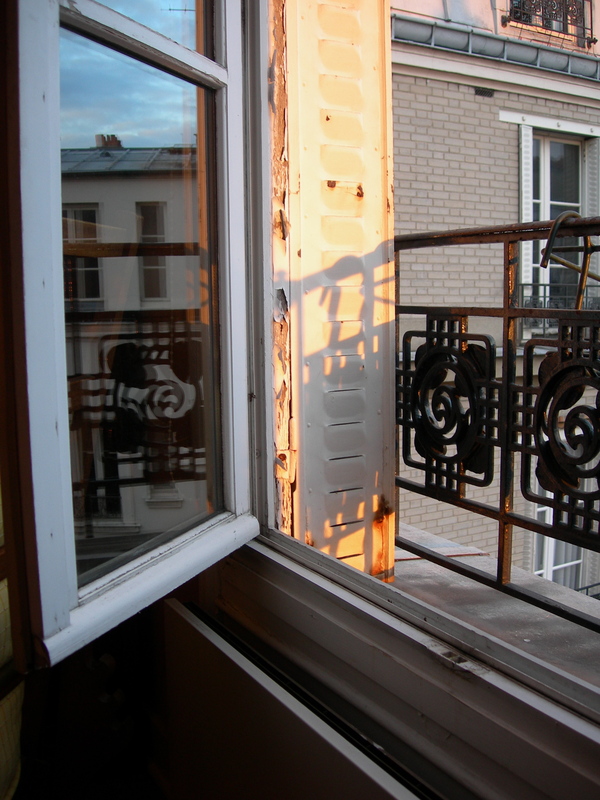 Here is a photo that Norman took of the rusty persiennes in a flat we rented several times in the Marais. Persiennes of this type have the advantage of tucking neatly into the window embrasure, so when they are open, they do not clutter the façade or obstruct the view. But closed, they are not particularly attractive. Modern shutters tend to be the roll-down kind (volets roulants), also very dull-looking, but practical. Some are electric and roll down at the push of a button, others have a hand-crank. Many are used as security shutters on commercial premises, and they tend to attract graffiti. 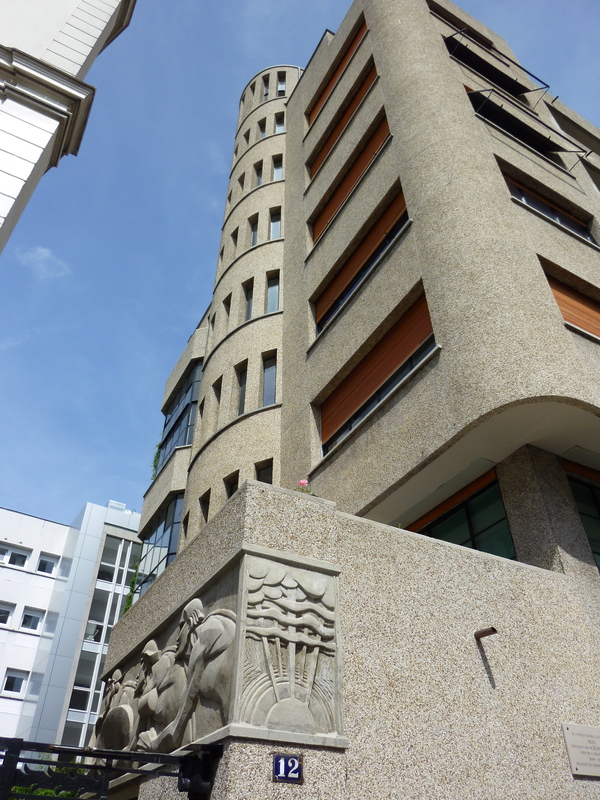 On this Art Deco building, note the frames that allow the shutters to function as awnings, open at the bottom. Fabric awnings and blinds are known as stores, and the window awnings that stand at an angle to the window seem to be called stores à l’italienne. (Stores also can mean interior blinds, as in stores venétiens or Venetian blinds.) I noticed awnings on quite a few institutional buildings. Here is the Port Royal maternity hospital. Exterior window blinds made of fabric seem quite common. 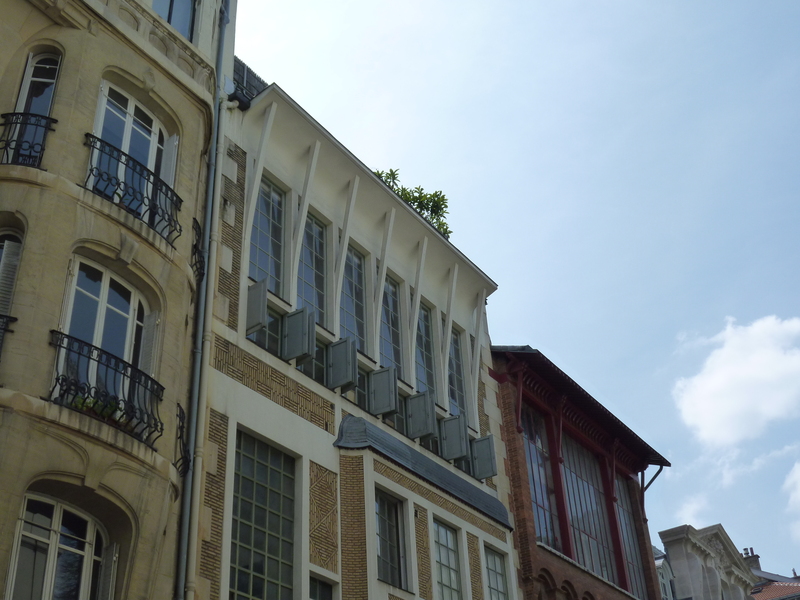 Here are some rather dingy ones on a university building in the Latin Quarter. Of course, they would be impossible to keep clean. Bamboo is similarly used for exterior window coverings. The more I looked at windows, the more variations I noticed. 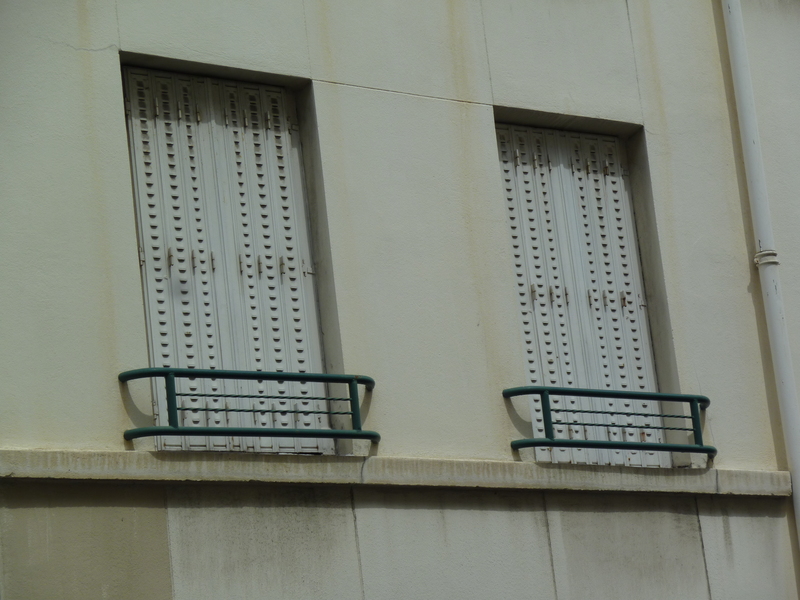 This row of small shutters intrigued me. With all those huge expanses of glass above and below, what is the purpose of the shuttered windows? And note the persiennes to the left that leave the curved top of the window uncovered. 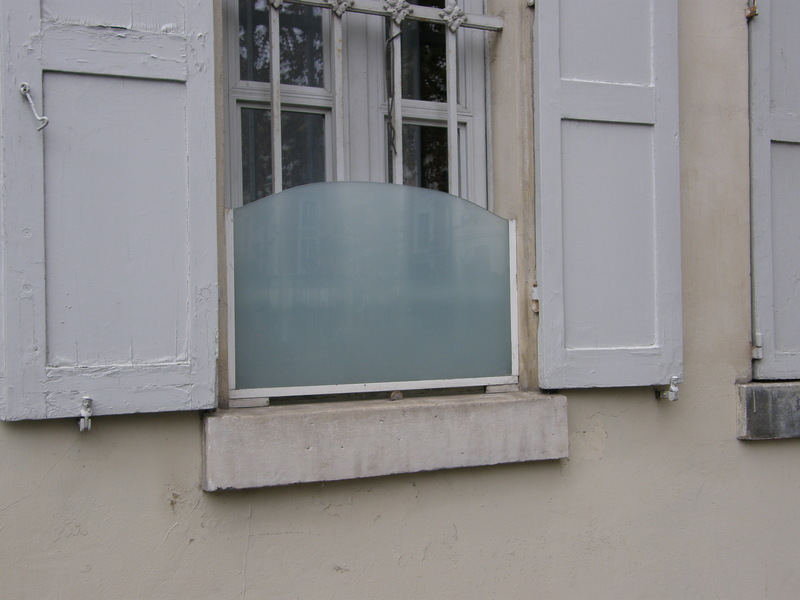 The question of what to do with windows of unusual shapes must bedevil some Parisian homeowners. Of all the words I discovered in my typology of windows, the most exotic is moucharabieh. This is a word from North Africa for the filigreed window coverings, usually carved wood, on Moroccan buildings. 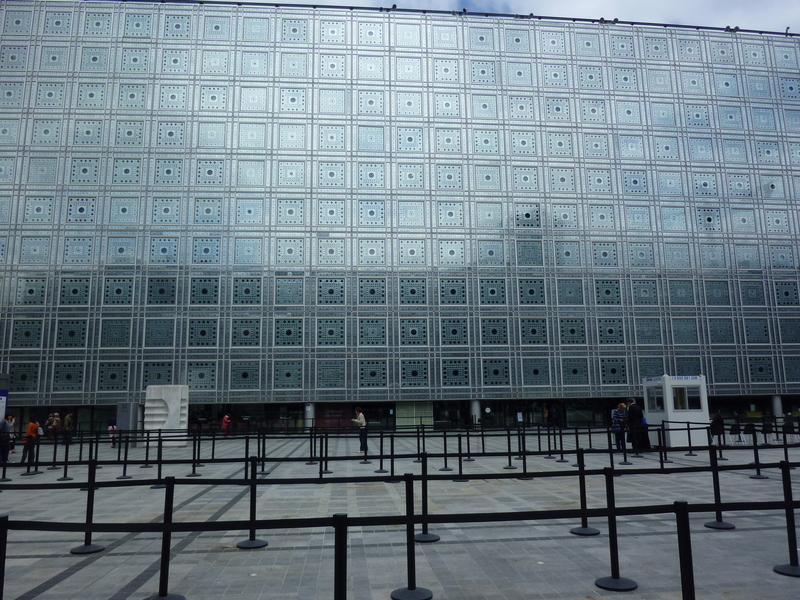 The most outstanding Parisian version is found at the Institut du Monde Arabe, where the openings are designed to respond to changes in the light by opening and closing. My typology is hardly exhaustive, and the possibilities are endless. One could compile a further list just of modern window coverings, quite a few of them one-off architectural features. 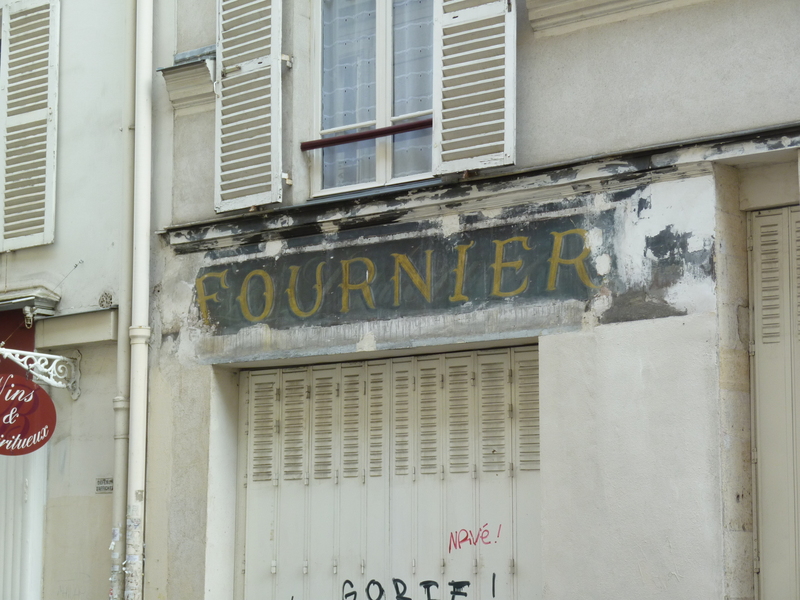 Next time you are standing at a Paris bus stop, you can pass the time by counting the number of types of shutters and window closings you can see. Chances are, even a single façade will have more than one type. How many do you see in the photo below? *Volet is a word with many, many meanings. This translation website shows the many ways in which this word is used, and “shutter” is mentioned only a couple of times. This entry was posted in Paris architecture, Paris streets and tagged arrêts bergère, arrêts de vent, arrêts de volet, awnings, espagnolette, Institut du Monde Arabe, jalousie, Maison de Balzac, moucharabieh, persiennes, Port Royal maternity hospital, shutters, stores à l’italienne, stores venétiens, volets, volets roulants. Bookmark the permalink. Merci Philippa! J’aime particulièrement les arrêts de vents, espcialement les arrets begere! 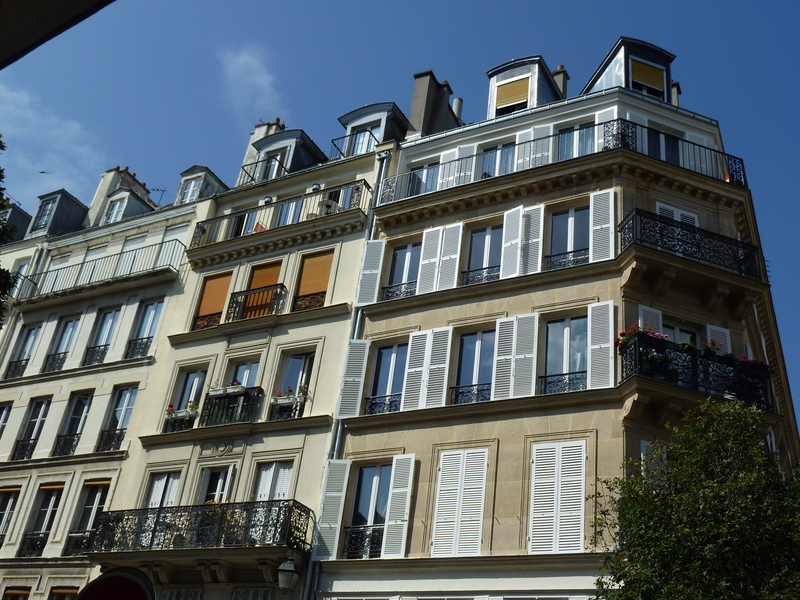 A Paris friend’s apartment had casement windows that opened into the apartment. She had a roll-up bamboo shade that she put on the outside of the window (somehow!) so that she could open the window and retain her privacy at the same time. Nice post! 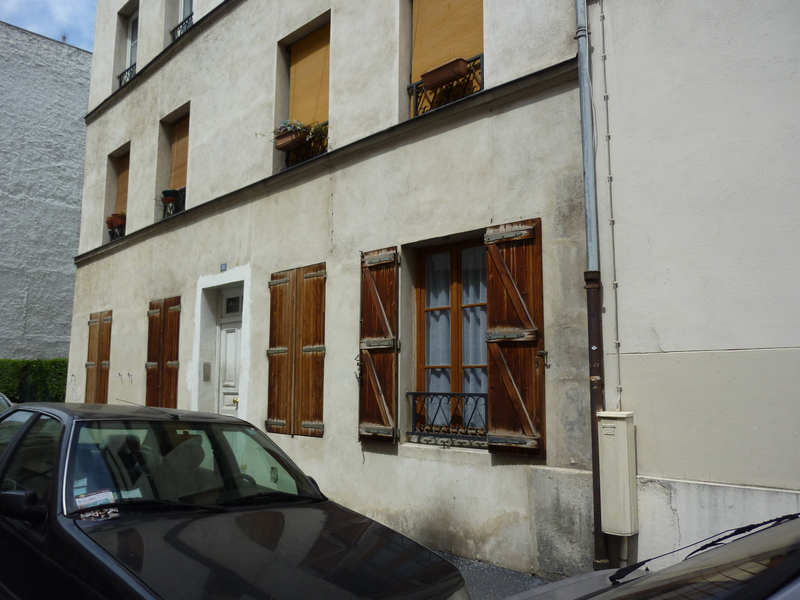 I am impressed that the Parisians still have working shutters instead of the horrid plastic ones that you see so much here in the US that are purely decorative and are just stapled onto the house. There is a law called La loi Malraux (created by André Malraux) that obliges owners of buildings to keep them clean – at least once every 10 years. That is why buildings in Paris are so clean. This is a collective law except for the shutters which are considered private. 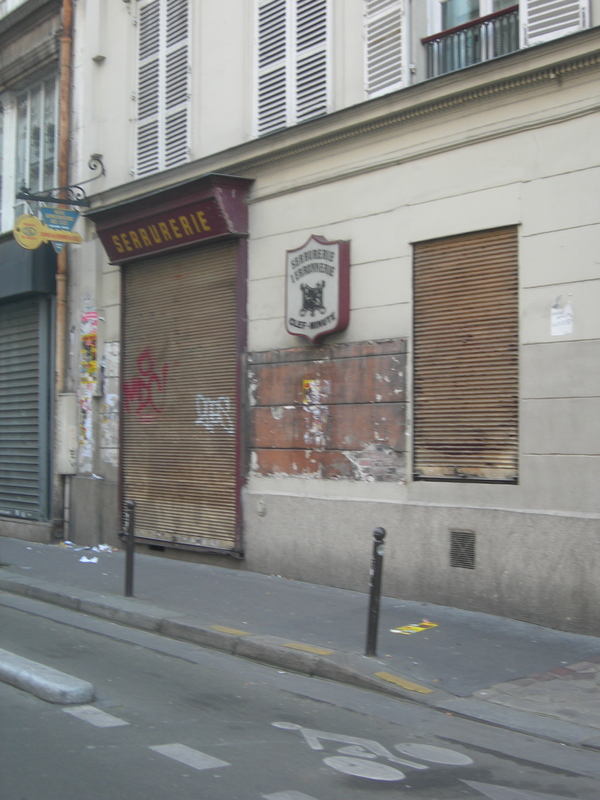 There in another urban law in Paris that is supposed to oblige the owners of a building to maintain them uniformly. Same when you replace a window, you should put up the same design even if the material is different – ex double glazing which is usually in Plastic frames because that is a lot cheaper. Unfortunately there is rarely any control of this so sometimes anything happens. It was the same for the height of buildings R+5 or 6 (Ground + 5 or 6 including the eaves) – We saw what happened to that since Chirac was Mayor of Paris. Shutters also are a give-away on the occupancy of a building ; Shutters closed during the day (or during holiday periods) usually means the people who live there are away. I never close mine for that reason! I would close them to keep the hot sun out. These should be more popular to reduce consumption of summer cooling energy. I love the fact that you did a story on French shutters! How do I share this on Facebook? Hi Maribeth, Just cut and paste the URL for the blog into a Facebook comment, and it will link to the page, usually with an illustration. “Bonjour Colorado” looks like a blog we should explore, especially since we have family in Colorado! I love the playfulness of the French language – “jalousie” – sophisticated and insightful. 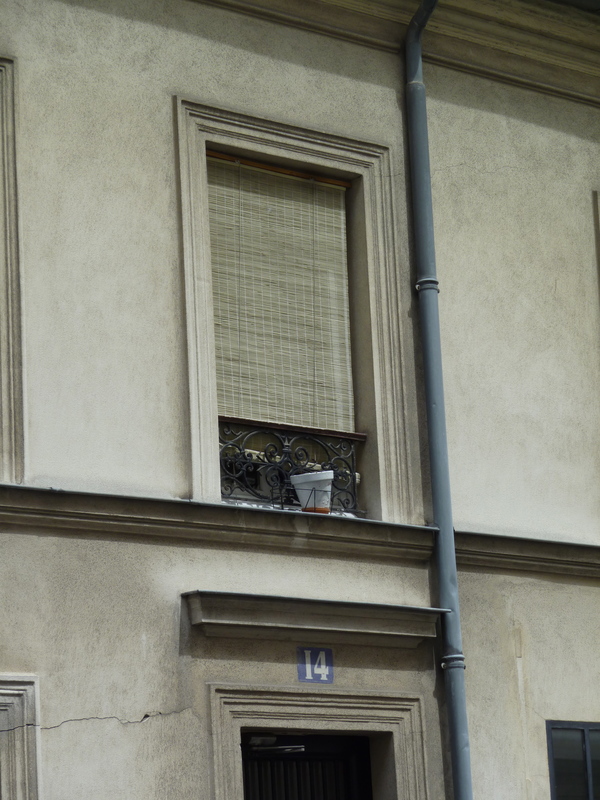 When I stay in Paris, my friend’s first floor apartment has wooden shutters – accordion style. Every window is individual, and you captured that so well. The French certainly value beauty, and riding the bus through Paris is a visual feast. Thanks for a charming post. The French are very jealous of their privacy!!! It is a cultural trait.